with one of the most important elements required for growth. 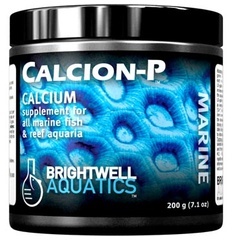 created for hobbyists maintaining multiple reef aquaria. Basic : Dissolve 2 grams (~ teaspoon) of product per 20 US-gallons of aquarium water in 8-fl. oz. of fresh water; add every other day or as needed to maintain the calcium concentration within a range of 412 - 450 ppm. When used in this fashion, 800 g treats up to 8,000 US-gallons (30,283 L). Advanced: Create a stock solution by dissolving 10 grams (~5 teaspoons) of Calcion-P in 8-fl. oz. of fresh water (preferably purified); each ml of the solution will increase the calcium concentration ("[Ca2+]") in 1 US-gallon (3.785 L) of water by 2.50 ppm. [Reference: Each g of Calcion-P will increase the [Ca2+] in 1 US-gallon (3.785 L) of water by 95 ppm.] If initial [Ca2+] in the aquarium is below 412 ppm, add stock sol'n at maximum rate of 10 ml per 20 US-gallons daily until desired concentration is attained, then dose daily or weekly as needed (see below). Maintain [Ca2+] within a range of +/-10 ppm. 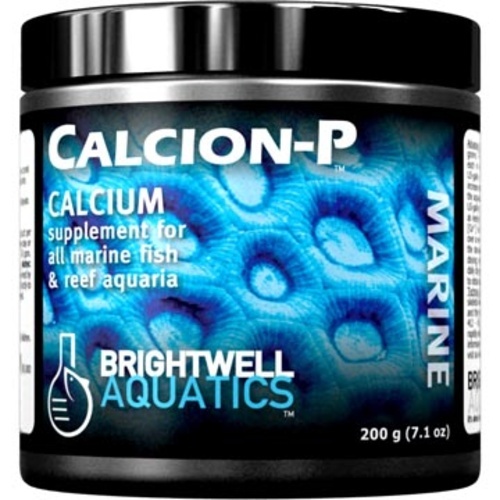 Once desired [Ca2+] has been acquired, measure aquarium's [Ca2+] at the same time each day over a one- to two-week period to determine the daily rate of calcium uptake (i.e. the decrease in calcium). To determine daily dosing rate (preferable to weekly dosing): estimate volume of water in entire aquarium system (US-gal. ); divide the daily decrease in [Ca2+] by 2.50; multiply this number by volume of water in system to obtain daily ml of stock sol'n required to maintain stable [Ca2+].